Stained glass window from St. Dominic’s Church in Washington, D.C. Photo by Fr. Lawrence Lew, O.P. The following reflection is part of an ongoing series about the life of St. Dominic & the Order of Friars Preachers. Tradition holds that during Dominic’s second visit to Rome, in 1216, he met Francis of Assisi in one of the churches there. Both were negotiating with the Holy See through their mutual patron, Cardinal Ugolino, later Pope Gregory IX, to obtain papal confirmation of their respective orders–the Order of Preachers and the Order of Friars Minor. Having seen Francis in a vision the night before, Dominic recognized him and rushed to greet him. 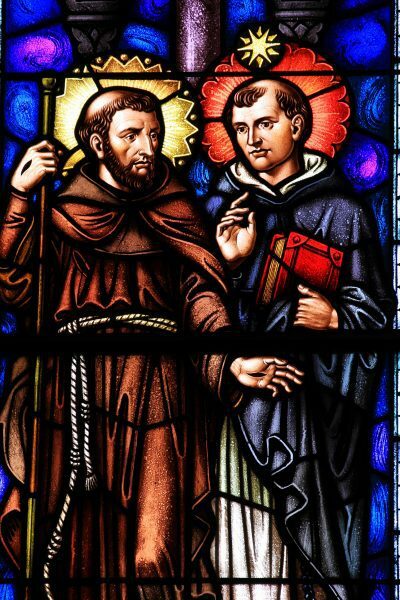 A close friendship sprang up between the two, and to this day Dominicans and Franciscans exchange visits on each other’s founder’s feast days as a sign of unity towards a common goal. The mutual influences of Dominic and Francis can be seen in the development of their orders: Francis may have influenced Dominic to expand the practice of the vow of poverty, and the Friars Minor adopted the Dominican constitutional system as a result of their turbulent history after Francis’ death. Fr. Lawrence Lew, O.P. (a member of the English Province) was invited by the Dominican Foundation to take pictures of some of the locations where our friars serve throughout the Northeast. During his time in Washington, D.C., Fr. Lew photographed the interior of the Church of St. Dominic. St. Dominic’s has been the church where our friars are ordained to the priesthood each May. Surrounding the church, is a collection of beautiful stained glass windows that chronicle the life of St. Dominic & the foundation of the Order of Preachers. Fr. Lew accomplished a great work by capturing the splendor of these windows, and in the process, the life of a towering saint.